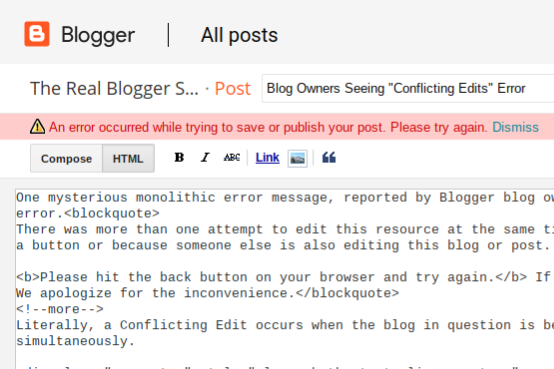 One mysterious monolithic error message, reported by Blogger blog owners for some time, is the mysterious "Conflicting Edits" error. There was more than one attempt to edit this resource at the same time. This may have been because you double clicked on a link or a button or because someone else is also editing this blog or post. Please hit the back button on your browser and try again. If the problem persists, please contact the Blogger Help Group. We apologize for the inconvenience. Literally, a Conflicting Edit occurs when the blog in question is being "edited" (modified / updated) by more than one person, simultaneously. This error won't go away, any time soon. Resource allocation / maintenance, when more than one person is involved, is an infinitely complex concern in IT. 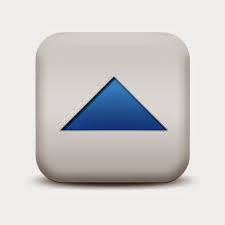 The IT concept of "Time Sharing", and its inherent challenges, have been significant for a very long time. Blogger blog publishing is fancy - but deep down, it's based on time sharing - two (or more) people accessing the same computer at the same time. This is similar to two people creating a new blog, and choosing the same blog name, simultaneously. It's classically described as a "collision". Every year, the Google Content Delivery Network becomes more complex. "Conflicting Edits" is an unfortunate side effect of the Google CDN, and the unpredictable nature of multi route IP Networking. Taken literally, I'd typically suggest two possible diagnoses. One person, with two or more browsers open, updating the same blog. Two or more persons, updating the same team blog. My advice would be simple, and trivial. 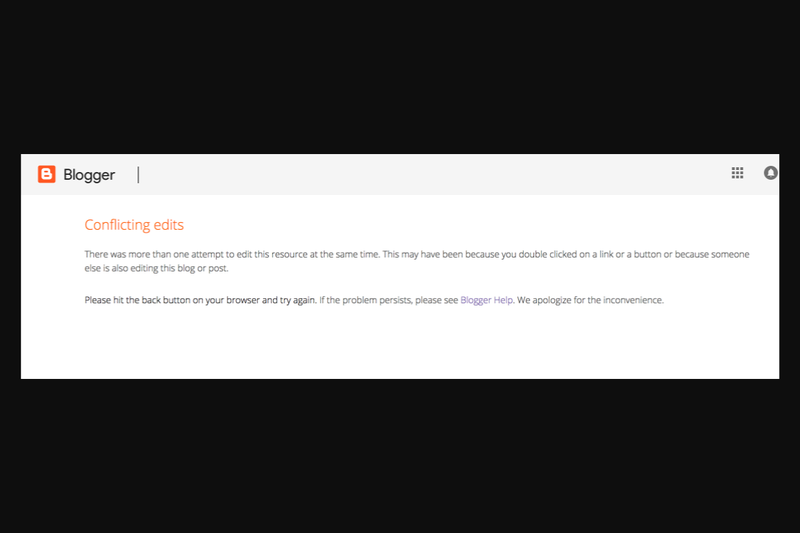 Clear cache, cookies, and sessions, restart your primary browser, and try again. Work with your teammates, and try to coordinate your activities better. Recently, we've been seeing increased reporting of the "Conflicting Edits" symptom. In some cases, owners of "single owner" Blogger blogs, who use single browsers, have been reporting this message. In these cases, it's not likely to have the same resource (blog component) open at the same time, without the blog owner suspecting that to contribute to the problem. A similar monolithic error. I bet that you've seen this one, too. In the latter cases, I'm suspecting that some setting conflict, on the local computer, is involved. The most likely culprit is going to be a cache / cookie / session conflict. Also consider that inconsistent Blogger access, caused by use of bookmarks on the local computer, causes use of conflicting Blogger aliases. 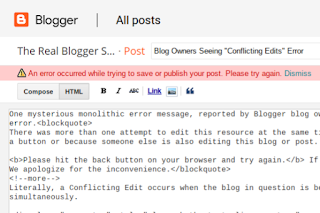 Sequential (not necessarily concurrent) use of Draft and Production Blogger could cause artifacts in the Blogger database, for a given blog. Recovery from the May 2011 maintenance release rollback has caused many odd details, such as this one. Possibly, try a combination of affinity testing and of differential testing, to learn more about the problem - or at least identify the possible universe of the problem. Could this also be caused by the Auto Save feature conflicting with when the blog post is manually published/saved? I think Jolly Delta Charger may be on to something: since the May crash, I've seen the conflicting edits message a lot more often, and I have a sense (can't prove it) that I'd seen a flash of the message about "Auto save stopped because of ..." at the same time. I get this error frequently on at least a dozen different computers, using three different operating systems and five different browsers. I reaaaaaaly think it's a Blogger problem, y'know?